Reverend Harley Everett Sampson, 80, of Lee’s Summit, went home to be with his Heavenly Father on November 3, 2018. He reached his final destination peacefully in his sleep with his loving wife by his side. A visitation will be held on Thursday, November 8 from 6:00 to 8:00 p.m. The memorial service will be held Friday, November 9 at 10:00 a.m. Both the visitation and memorial service will be held at Lee’s Summit First, 425 SW Oldham Parkway, Lee’s Summit, Missouri. Harley was born October 9, 1938, in Garden City, Iowa, to Harold and Esther (Brandt) Sampson. After graduating from Stratford High School in Stratford, Iowa in 1956, he served in the United States Navy from 1958 to 1962. Upon discharge from the Navy, he continued his education at Central Bible College in Springfield, Missouri. He met his wife, Donna Varney, at Central Bible College and they were married on June 15, 1963. He graduated in 1966 with a Bible degree. He served as the pastor at Tama Assembly of God in Tama, Iowa from 1966 to 1972. He served as the church camp director for the State of Iowa from 1972 to 1976. 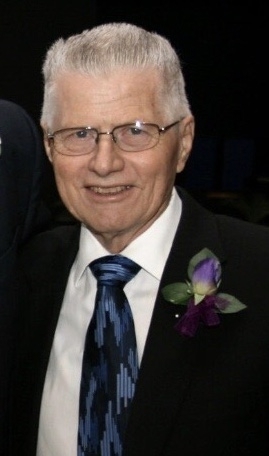 He served as the pastor at First Assembly of God in Lee’s Summit from 1976 until he retired in 2010. Even after retiring, he still found ways to volunteer and work around the church. He spent his entire life serving Jesus and loving people. He was very active and loved being involved in the church and community. He loved his wife, children, grandchildren and great grandchildren and relished spending time with them. He is survived by his wife of 55 years, Donna (Varney) Sampson of the home; his brother, David Sampson; his son and spouse, Todd and Dianna Sampson; his daughter and spouse, Kim and Scott Polina; his daughter and spouse, Rhonda and Jeff Weber; his daughter and spouse, Sharolynn and Michael Myers; his grandchildren, Jennifer and James Hensley, Ashley Sampson, Jacqueline Sampson, Amanda Sampson, Amber Polina, Austin Polina, Mackenzie Polina, Chris and Kaytlyn Weber, Justin Weber, Bradley Myers, Zachary Myers and Makayla Myers; and his great grandchildren, Payton, Kyla and Layla Hensley, Amelia and Liam Murphy, and Lucy, Elias and Bennett Weber. He was preceded in death by his father, Harold Sampson; mother, Esther Sampson; sister, Lois Bergman; and brother, Richard Sampson. Arrangements are with Langsford Funeral Home in Lee’s Summit, Missouri. Burial will be at the VA cemetery at 2:00 p.m. in Higginsville, Missouri. In lieu of flowers, donations may be made to Susquehanna Assembly of God, or a church of your choice, to provide camp scholarships to send underprivileged kids to church camp. He was a light of love, faith and hope. I am honored to have heard some of his sermons through the years sitting next to my Mom, Virginia Brooks. Pastor Sampson inspired her on her path to a faith she so deeply believed in. My sincerest thanks and respect to him for all he did at First Assembly in Lee’s Summit. May your memories comfort you. Now his light shines brightly as he takes his rightful place in heaven. God Bless and much love! Pastor Sampson was one of the finest men we have ever known. He took our family in the first night we met him and Donna. Pastor Sampson will always have a special place in our hearts. We were truly blessed to have been under his ministry. What a wonderful man he was! Pastor Harley was a great man of God. John & I both loved & appreciated him very much. Our prayers & thoughts will continue to be with his wife Donna and the family. I thank God for putting Pastor Harley Sampson in my life. he led my sister my mother and me to the LORD when i was a preteen. and was the reason i still go to church today. and Blessed my family for many years, in many ways. I look forward to seeing him again some day. god bless you all. We are so sorry to hear that Harley passed. Our hearts and prayers are with all of you. We always felt loved by your dad when he was around and made us feel part of the family – he will be sorely missed by all. What an inspiration to both Laval and I he has been an anchor !!! Our hearts are broken we will miss him dearly!!!!! My sympathy to you, Donna, and all the extended family. Remembering the days we shared at CBC. My husband, David, was promoted to heaven 14 years ago. You will find the comfort the Holy Spirit gives to widows. You will begin receiving a quarterly newsletter called Uniquely His for AG ministers widows. I am one of the editors. Blessings. Pastor Sampson was a true and dedicated man of God and Pastor of many. His heart to serve to further the kingdom of God was his great gift to everyone he came to know and pastor. My deepest sympathy to Donna and the family. Pastor thank you for all your spirit filled guidance and encouragement in my life. As you enter the eternal life with you Lord and Saviour and his welcoming words. ‘Well done my good and faithful servant”. Since 1934, Langsford Funeral Home has provided the Lee’s Summit area, as well as the entire Kansas City Metro area, the finest in funeral arrangements and facilities. Our reputation as “The Best” is evidenced by over 80 years of service and the multiple generations of families we have helped.